Leading the pack is Ahtisa Manalo from the Philippines. The 21 year old beauty from Quezon with the striking resemblance to 2016 Kylie Verzosa seems to be on track to give her country a 7th Miss International title, which will tie the Philippines with Venezuela as the countries with the most number of wins. Manalo’s styling and presentation have been well received by the fans and the Miss International Organization, so it could very well be three in a row for Asia. Hot on her stilettos is Mexico’s Nebai Torres, who has literally not put a foot wrong during her entire stay in Japan and has everything it takes to give her country a third crown. Miss Thailand, Keeratiga Jaruratjamom has been a strong favorite to win her country’s first title at this pageant but we have some doubt whether she will impress enough in the final speech round. Poland’s Marta Paluck is another beauty that can not be overlooked. With one of the most beautiful faces in the competition, height and poise (and Miss World experience), she could take it all. Rounding out our top 5 is Venezuela’s Miriam Velasco, whose beauty is quite polarizing. She has been strong throughout the competition and, who knows, maybe her country’s tally at this pageant will reach eight titles or the Tokyo panel might not be so generous with their love for her! Panama’s Shirel Ortiz has the facial beauty and charm that usually go down well in Japan, while the same can be said for Emily Tokic from Australia. Laos has sent an exceptional delegate in the form Piyamarth Phounpaseth but we are not sure if she has the communication skills to match her beauty. Delegates from the country of the current title holder usually struggle, but we think Vania Herlambang will be able to hold her own and defy the odds. Africa’s strongest bet comes in the form of Reabetswe Sechoaro from South Africa who is perhaps the strongest delegate this country has ever sent to this competition. But as we know the Miss International Pageant has never shown a strong appreciation for beauties from the African continent and they are yet to win a title at this pageant. Bolivia’s Maria Elena Antelo and Haiti’s Cassandra Chery have both been very consistent while Cote d’Ivoire’s Jemima Gbato has strong support from her country and the cute factor, so Africa might be lucky enough to have more than one delegate in the top 15. 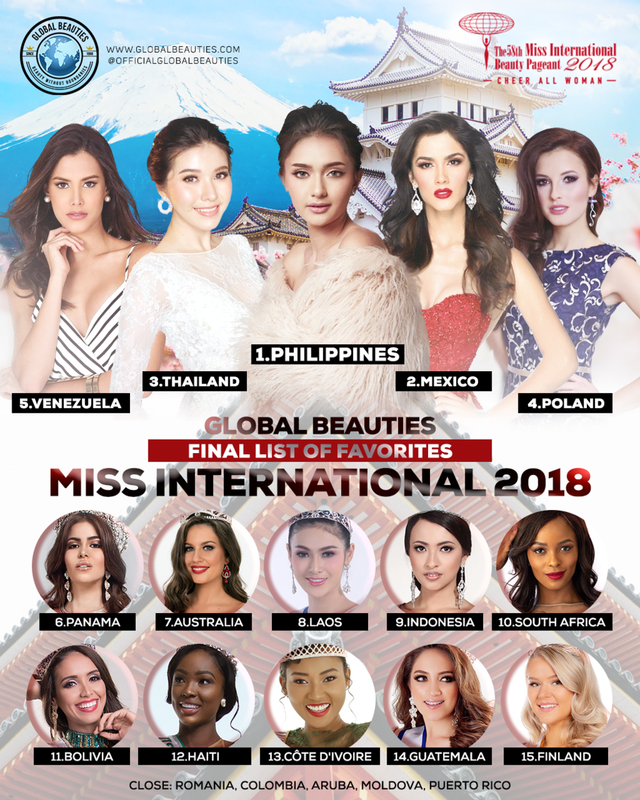 Guatemala has only placed twice in the history of Miss International but many believe they can do it again this year while Finland is traditionally a Miss International powerhouse and has the typical type of beauty the Miss International judges favor. We would like to wish all 77 delegates the best of luck and we are hoping to see an improved final and a worthy successor for lovely Kevin Lilliana from Indonesia!